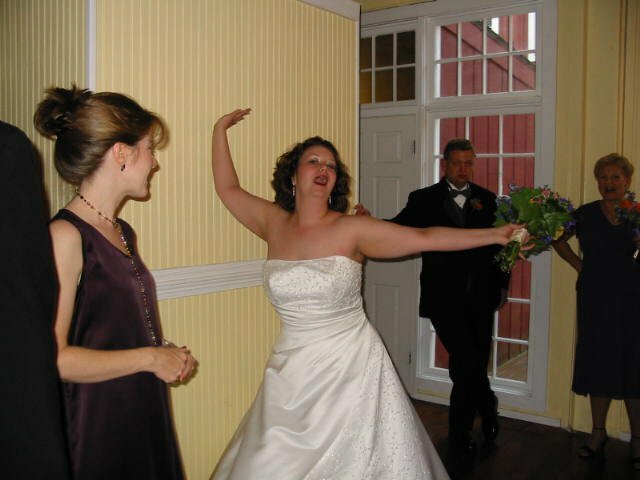 My pal Chuck over at Always-Drunk.com wrote a piece on an incident from early in her marriage, and you can read about it here. It reminded me of an incident that I've probably written about here before. Actually, I just checked, and maybe not. But anyway. August 20, 2005. Roswell, Georgia. I am the bride, so I'm in a big, white dress. I can't really blend in because, let's face it - I'm getting top billing today. Matt and I had our first dance, and I cut a brief rug with my father and my new uncle-in-law. Now, from a required floor time standpoint, my new husband is done for the night. Me, I'm just getting started. And we have this killer band that is playing tons of great stuff. Just blowing it out of the water. The band was my Father's doing. He heard them at a different wedding and said we had to have them. In fact, I remember him calling his friend Marty to get the contact info for them. Anyway, my husband and some of his pals are out smoking cigars and drinking whiskey. The band segues from some fast tune and starts playing "Easy Like Sunday Morning". I move to the edge of the floor and have this serious epiphany. What were your moments of clarity? And did they involve heavy, beaded, crinolined dresses? I've never had a moment of clarity in a dress, but I have in fishnets and high heels. Most moments of clarity seem to come when we're alone, which is one of the few advantages of being alone. And yet, at this time of year, I'm reminded that in Truman Capote's "A Christmas Memory" the moment of greatest insight comes during a shared moment. If you've read the story you know what I mean. If you haven't you'll have to read it to find out.